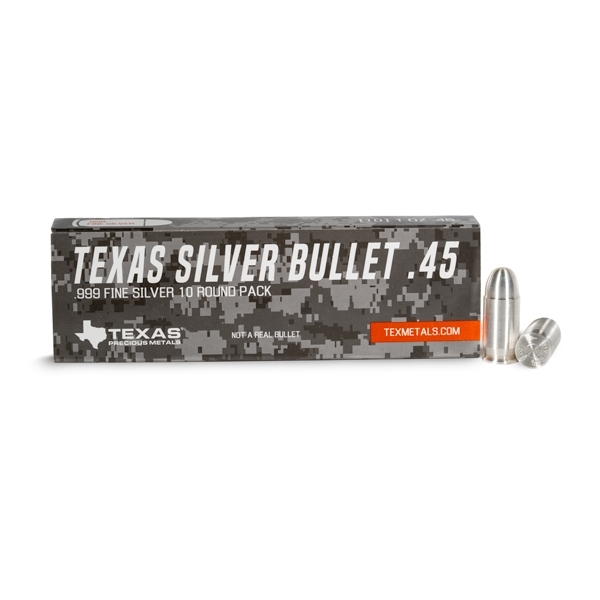 Texas Silver Bullet: 1 oz. Silver Bullets modeled after a .45 Caliber round. The 1 oz. 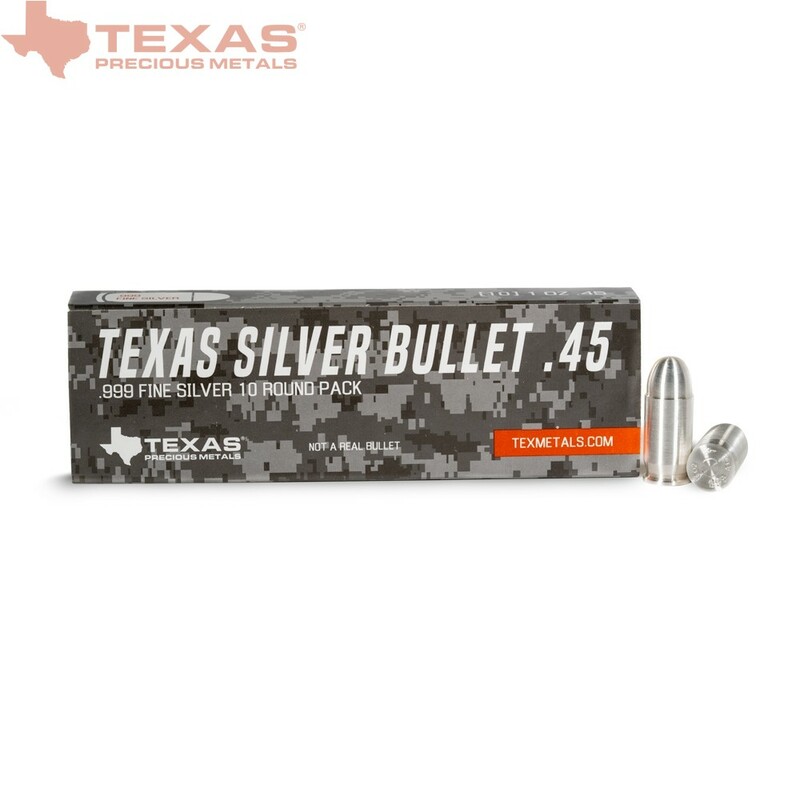 silver .45 caliber bullet is modeled after the classic .45 handgun cartridge designed by John Browning in 1905 for the ACP (Automatic Colt Pistol), or .45 Auto. After rounds of evaluations and several years of successful military trials, it was adopted as the regulation chambering for Colt's M1911 pistol, the standard-issue sidearm for the forces until 1986. 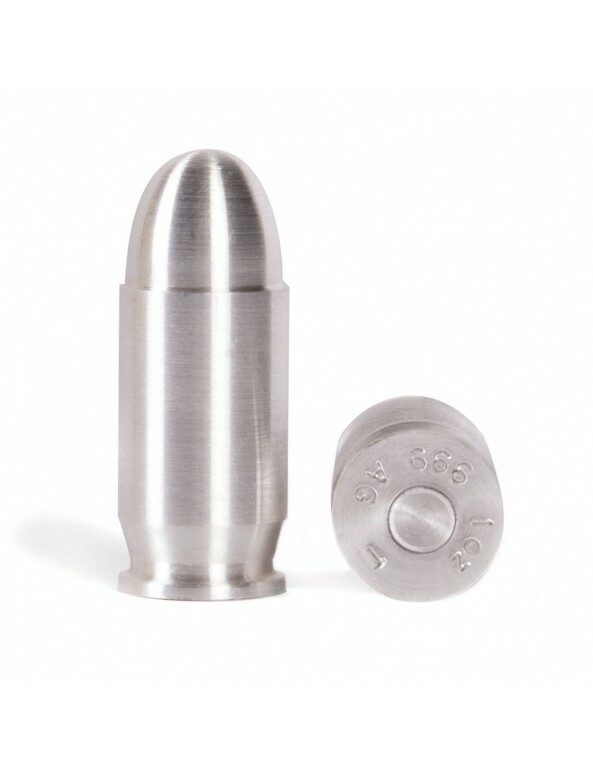 Although the ACP is no longer the main sidearm of the U.S. military, police and military units worldwide still use firearms firing the .45 cartridge; moreover, the efficacy, speed, and accuracy of the cartridge has preserved its abiding reputation as a favorite among large-caliber sport shooting enthusiasts. 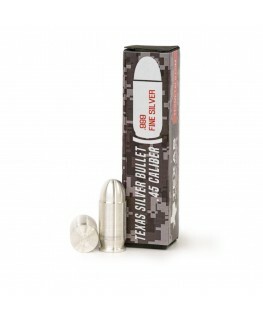 The headstamp on the bottom of each Texas Silver Bullet identifies its individual weight and purity of .999 fine silver. 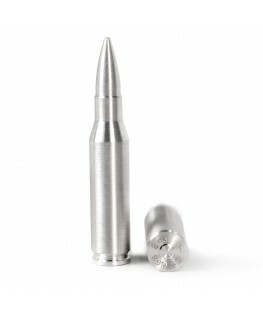 Although brand new, silver bullet replicas typically show some minor visual flaws created during the minting process. 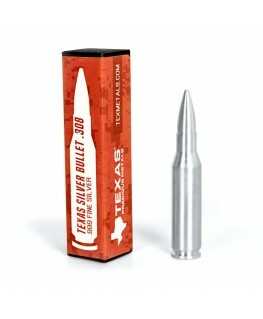 Specifications per bullet: approximately 30.6 mm (1 7/32 inches) tall and 12.1 mm ( ½ inch) wide. 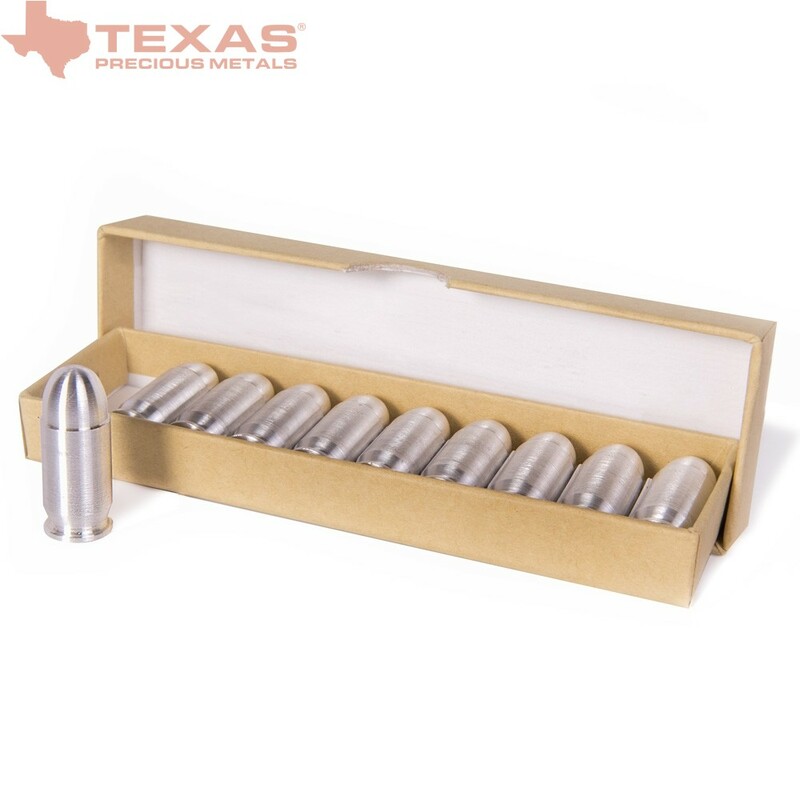 The Texas Silver Bullet .45 caliber silver bullion bullets are available for purchase in a set of ten, packaged in a custom-designed box that is perfect for a gift presentation. 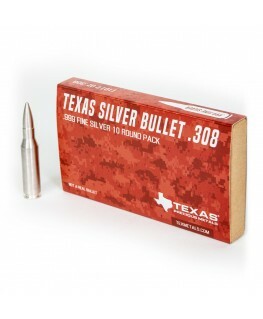 The cardboard box features our Texas Precious Metals box sleeve emblazoned with the "Texas Silver Bullet" logo with the ".999 Fine Silver" and "1oz. 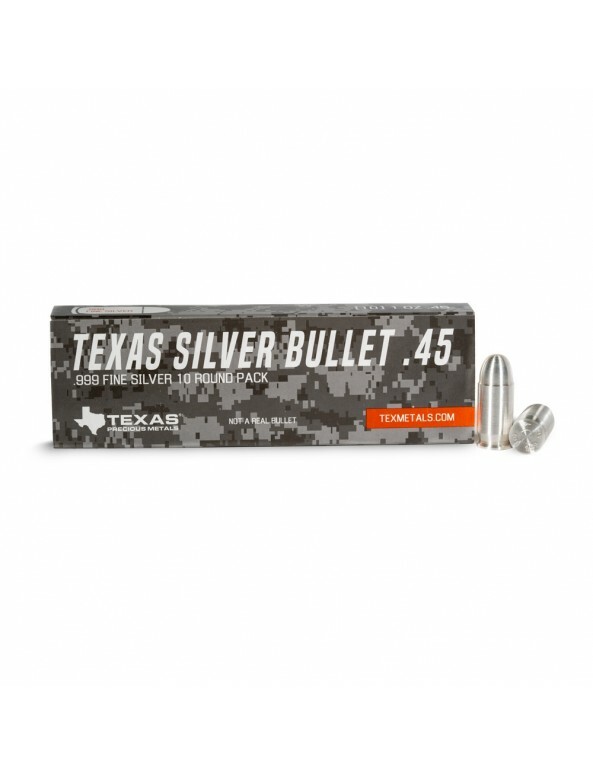 Silver 45 CAL" designations. Total 10-Count Box Weight: 10 oz. 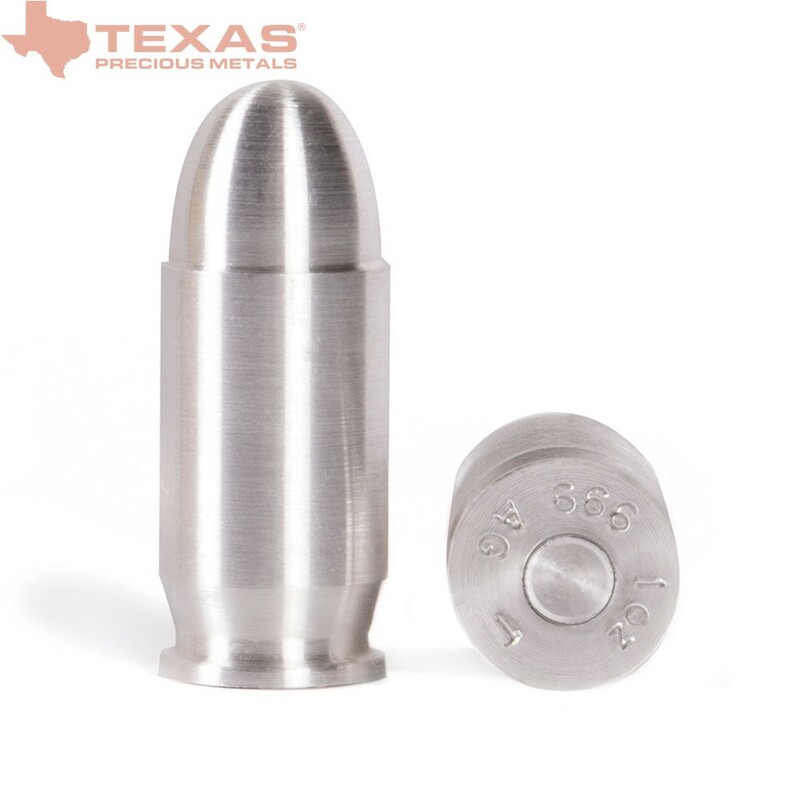 While it’s not actually a bullet, the .45 caliber round silver bullion bullet is truly made of silver, minted in .999 fine silver with a beautiful finish that is sure to elicit admiration from everyone who casts an eye upon it. 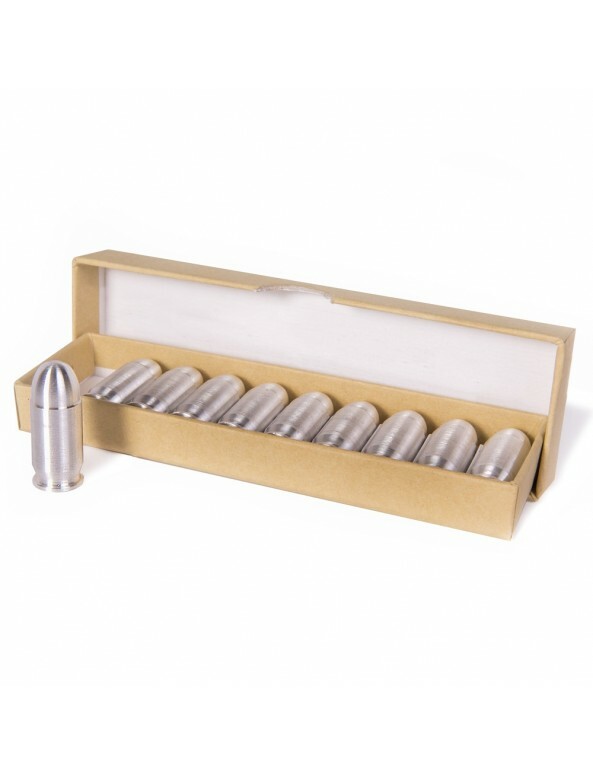 Silver bullion bullets that look like real bullets should never be fired from a weapon, however; they are replicas of actual ammunition and minted just like a coin, round, or bar. Danger is no stranger to gunfighters and fools, so never shoot one of these products from a weapon.